When you purchase a Bernina, Brother or Pfaff sewing, overlock or embroidery machine at Sew Complete, we offer you the following services at no extra charge. Sew Complete will provide free service for 1 or 2 years after the purchase date. This service work is done at our shop and is in addition to the manufacturer’s warranty. The service includes answering mechanical questions, as well as tune up or mechanical adjustments as necessary. Depending on the machine you purchased, you will be entitled to attend up to four 3-hour hands-on lessons to learn how to use your new machine to the fullest. If you also purchase computer software for your machine at Sew Complete, we encourage you to come to the appropriate Computer Software trainings, which we hold every season, free of charge to you. You will automatically become a member of the Sew Complete Sewing Club for one year, at no cost to you. Sewing Club meets ten times per year, with three different time choices each time. 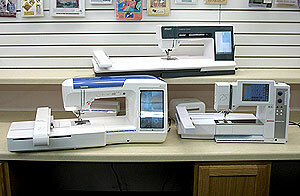 Many sewing techniques are demonstrated at club meetings. It is a chance to socialize, share and keep up with current trends in sewing. Club members also receive 10% discount on merchandise other than machines and software. After a year, you may renew your membership for a nominal fee. For one year following your purchase, you are entitled to a 10% discount on all merchandise, with the exception of another machine, software or furniture, which is otherwise discounted. We are available to help you with your sewing questions and questions about your sewing machine, anytime, including before and after you take your lessons. We attend as many of the manufacturer’s trainings as we can, most all of them, to be able to be as knowledgeable as possible. If you are not in a local calling area, we have a toll free number for you to use when you wish to reach us regarding sewing questions or service. This commitment is exclusive and is in addition to the Manufacturer’s Limited Warranty. It has a value of up to $1000 and applies only to the machine identified below. It is honored only at Sew Complete in Eau Claire, WI.